Today, the Church begins her preparations for the Great Fast ( aka, Great Lent). In the coming weeks we will delve into what the Great Fast means for us. In our preparation for the Great Fast, we must notice a theme emerging. In the parable of the Pharisee and the Tax Collector, the Pharisee was not justified because he failed to see the image of God in the tax collector. (“I thank you that I am not like this tax collector,” Luke 18:11). In the Parable of the Prodigal Son, the older son was not justified because he failed to see the image of God in the prodigal returned home. (“But as soon as this son of yours came, who has devoured your livelihood with harlots, you killed the fatted calf for him,” Luke 15:20). Today, in the final judgment, the Lord says to the condemned goats, “Assuredly, I say to you, inasmuch as you did not do it (show charitable works of mercy) to one of the least of these, you did not do it to me” (Matthew 25:45). In the popular mind, Lent is a time for self-denial. Stop, that’s it. But why? Because if we do not deny ourselves, we cannot see the image of God in the other, in each and every other human being that he has created. 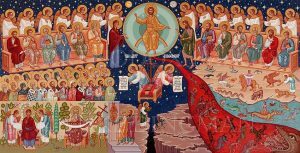 Possibly the Last Judgment was commemorated on this Sunday, because it is the conclusion of a “Church Year.” Next Sunday, Cheesefare Sunday, we begin again with the story of Adam and Eve and the Fall. The Great Fast is our journey through the Old Testament, which is concluded with the New Covenant: the Mystical Supper, the Crucifixion and the Glorious and Life-giving Resurrection of our Lord and God and Savior Jesus Christ. We then see through the lens of the Resurrection how God’s plan is fulfilled in Christ in the Gospel of John the Theologian (until Pentecost), in the Gospel of Matthew (from Pentecost to the Exaltation of the Cross), and in the Gospel of Luke (from the Exaltation of the Cross until the Sunday of the Prodigal Son). Then on this Sunday, we celebrate the last and final and eschatological mystery of the Final Judgment, in which God brings to completion and perfection the whole human story. That may be why, on the day before the Sunday of the Last Judgment, we remember the death of each human being, which is the completion and perfection of our own individual story and our inclusion in God’s ultimate divine plan. Interestingly, the Roman Church read the Gospel of the Final Judgment on the last Sunday before Advent, which began their liturgical year.